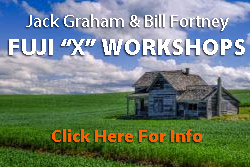 Our photo workshops will be attended by owners of the Fujifilm “X” System cameras and lenses. The workshops are not, however, dedicated to only Fujifilm “X” camera shooters. All are encouraged to attend!